A creeping lava stream is threatening Hawaii from the Kilauea volcano, approaching approximately 50 homes in the area. Although the lava has slowly been on the move since June, officials now say that it is moving at 10 to 15 yards per hour. 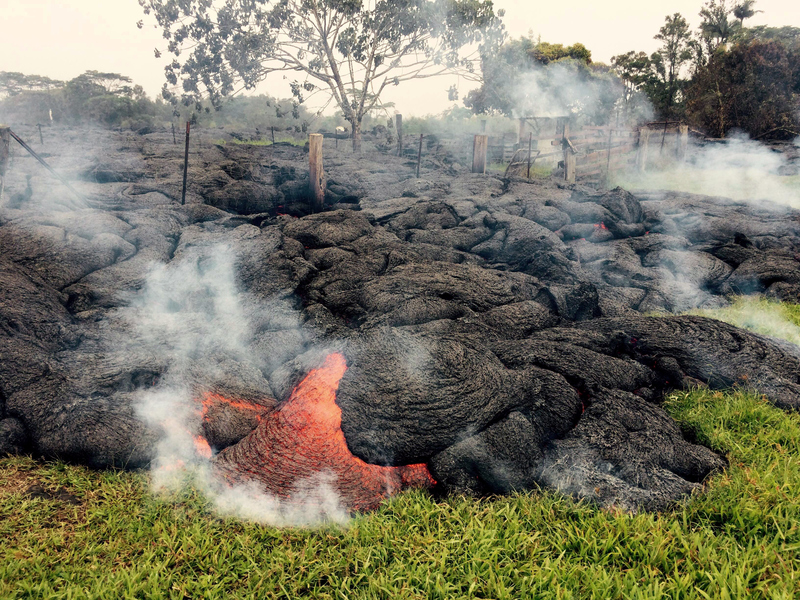 On Tuesday evening, Troy Scott of the Hawaii County Civil Defense Agency told CNN that molten rock was found about 350 yards from the nearest homes, but experts said that by Wednesday, the flow could be visible from homes in its path. Officials said that there is no way to stop the 2,000-degree river from hitting Pahoa, a town of about 1,000 people in Hawaii County. The red hot molten liquid, which is chest-high in some places, is hot enough to burn down homes and has a very unpredictable path. Residents have already prepped for evacuation as lava overtakes the first private property, thus far easily claiming a shed as its victim. The lava flow has already overtaken a predominantly Buddhist cemetery over the weekend. Looters have begun to take advantage of early evacuees, local business owner Matt Purvis told CNN. Purvis said that two of his brother-in-laws' houses were broken into. According to CNN, most people have already vacated their homes, preparing for the worst. Kilauea volcano is counted as one of the world's most active. It has been continuously erupting since 1983, but not in cinematic explosions that you commonly associate with volcanoes. This latest activity began when a vent in the Pu'u O'o crater began to spew smoke and lava nearly four months ago. The remote Puna region on Hawaii's Big Island relies on Pahoa for groceries and supplies, so if the town is cutoff by lava or destroyed, nearby residents may have to drive more than 100 miles for everyday essentials. Officials have not shutdown travel to the Big Island, citing the lava flow as an isolated incident. But they are trying to prevent helicopter tours who want lava views from flying over the airspace in the coming days.